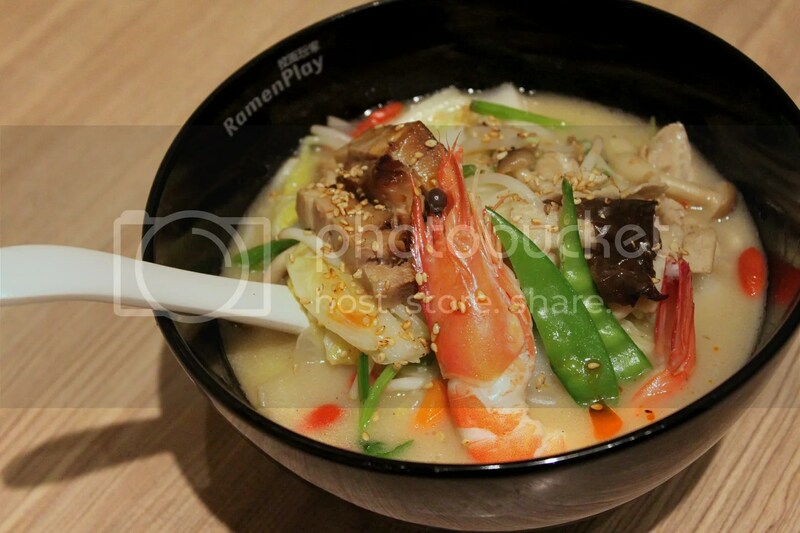 I found myself heading back to RamenPlay at Nex to sample their Seasonal Summer Menu which will be available from 23 July till 30 September 2012. My previous tasting at RamenPlay last year had been positive one, where I discovered that chain restaurants can surprisingly offer quality rivaling standalone “authentic” ramen-yas. 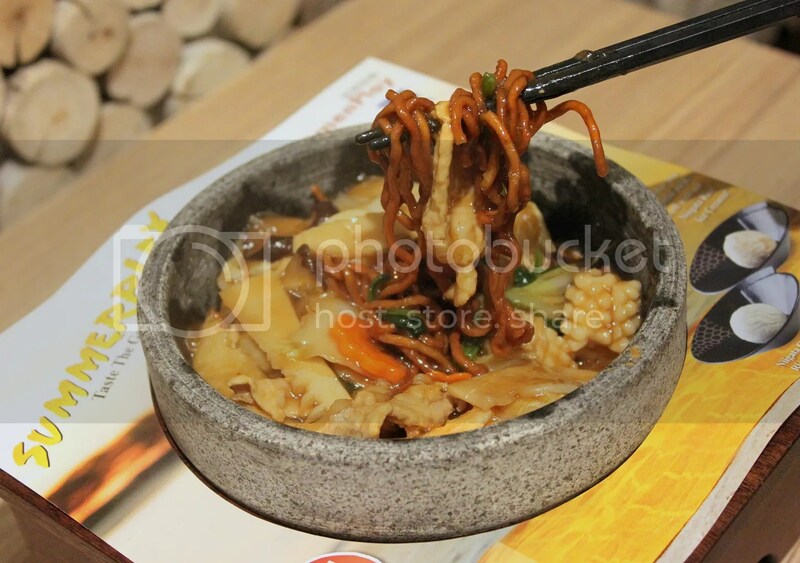 For their summer menu, RamenPlay has introduced 3 new mains, 2 desserts and 2 drinks. Before digging into the new items however, we tried out some of their existing appetizers. 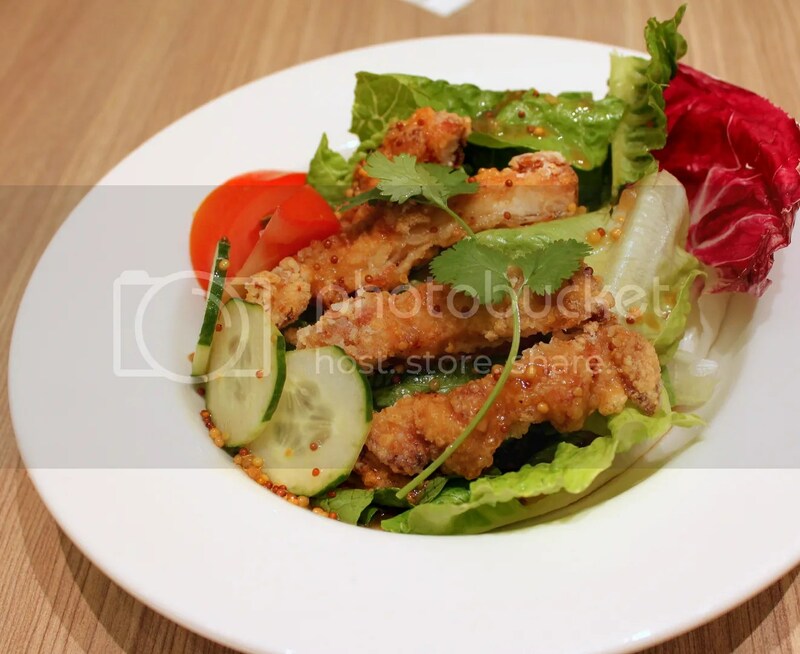 For fried chicken fans, do order the Mustard Chicken Salad. It’s a generous slab of chicken thigh that is fried to perfection, crisp on the outside, juicy and tender on the inside and yet doesn’t give off an excessively oily feel. 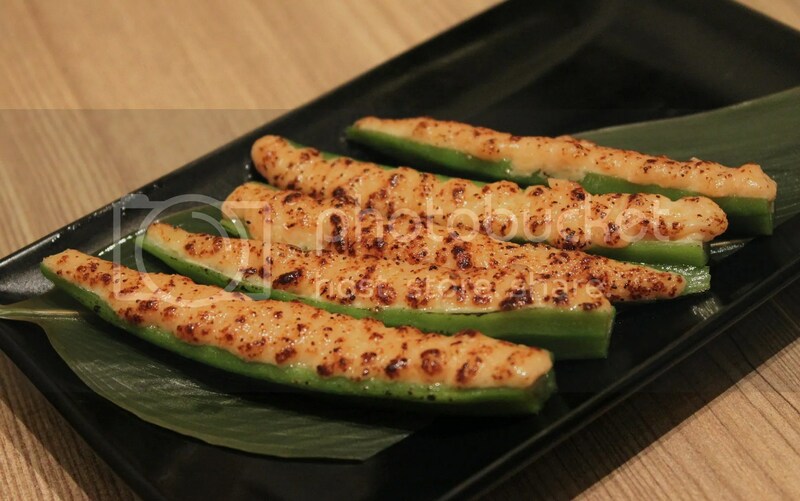 My favourite appetizer here is the Okura Mentai. Poached ladies fingers topped with mayo, cheese and cod roe and subsequently seared lightly for that nice char. Tiffany, one of the hosts for lunch, started raving on about how awesome mentaiko is. Her tip of the day: Go to Ikea, buy their Mentaiko paste which is sold in a tube form and squeeze onto bread as a spread. The Bamboo Chicken is pretty good as well. 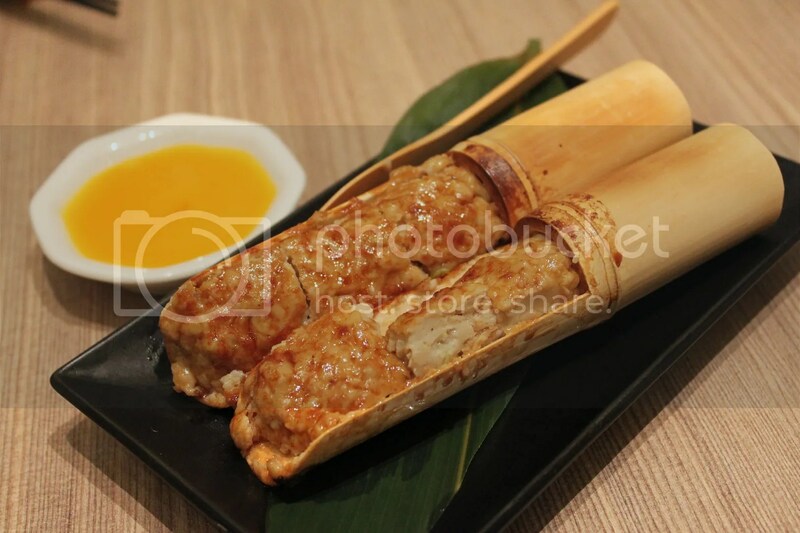 Tender minced chicken is compacted into bamboo sticks and grilled to a lovely shade of golden brown. While some might cringe at using the raw egg yolk as a dip, I personally think that the creamy yolk goes really well with the chicken. 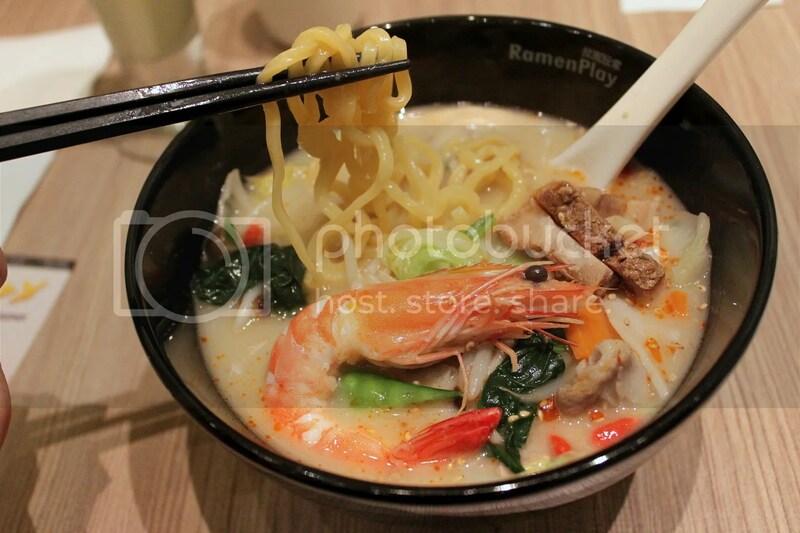 A slight deviation from the usual Tonkotsu, RamenPlay has come up with the Herbal Infused Tonkotsu Ramen. As the name suggests, herbs such as wolfberries, fennel seeds and dang gui (aka Chinese Angelica) are boiled with RamenPlay’s signature Tonkotsu broth to impart a mild herbal flavour. Garnished with Honshimeiji Mushrooms, Eringi Mushrooms, King Oyster Mushrooms, Cabbage, Braised Pork and a Prawn, this light tasting ramen is something I would desire when I’m down with a cold. RamenPlay’s 2 other new mains are identical as they both employ the use of Umani Seafood Gravy. For the Umani Crispy Ramen Ishinabe, the Umani Seafood Gravy is poured over ramen that is flash-fried and for the Umani Rice Ishinabe, the Umani Gravy is poured over premium Nigata rice. 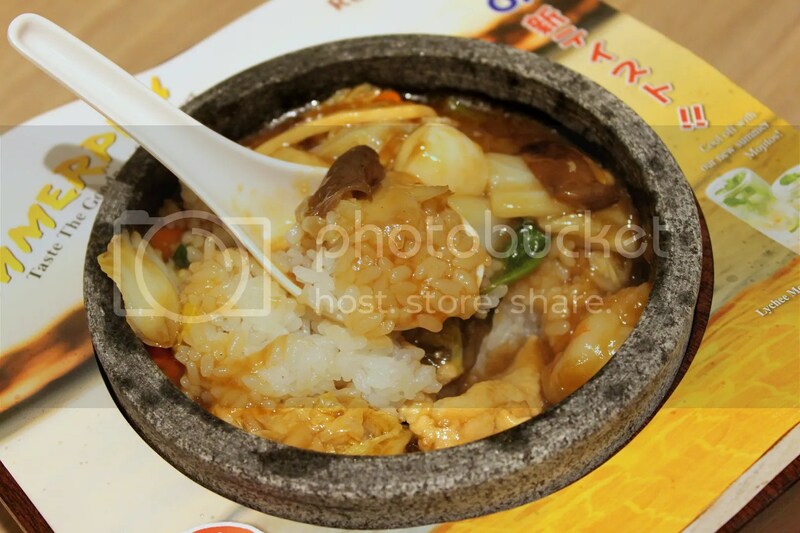 The gravy is influenced by Chinese cooking styles and tastes somewhat similar to the oyster sauce gravy you would get in a claypot tofu dish. Unfortunately, I wasn’t very taken by these 2 mains as the gravy comes across as unexciting for us Chinese folks who have been eating zi char for a good part of our lives. 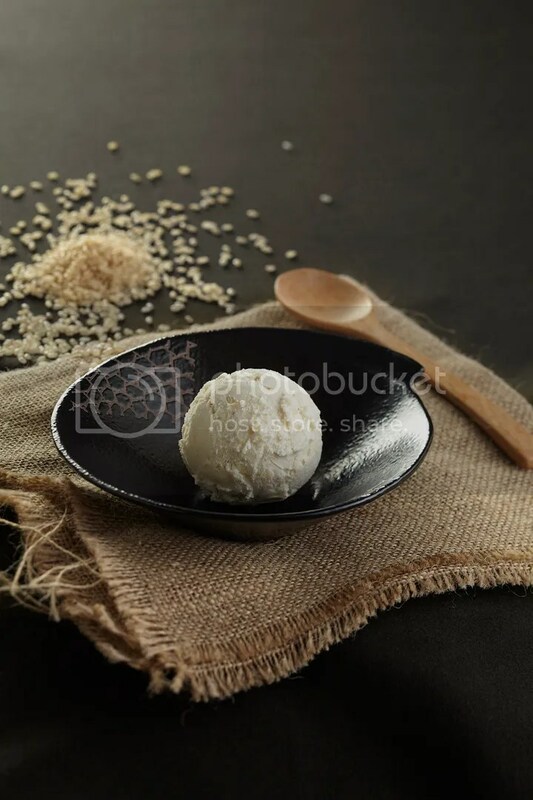 There are also 2 new desserts available, the Niigata Original Rice Ice Cream and Niigata Brown Rice Ice Cream. 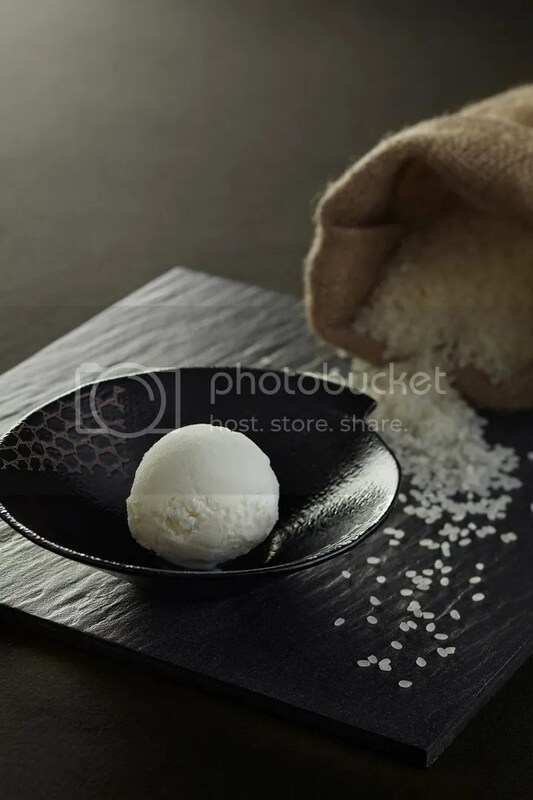 If you are into plain Vanilla Ice Cream, stick with the Original Rice Ice Cream which comes dotted with broken bits of rice in the ice cream. But if you like a slightly grainier taste and coarser texture like how Pulau Hitam tastes like, the Brown Rice Ice Cream is for you. The 2 new drinks available from the summer menu are the Yuzu Mojito and Lychee Mojito. 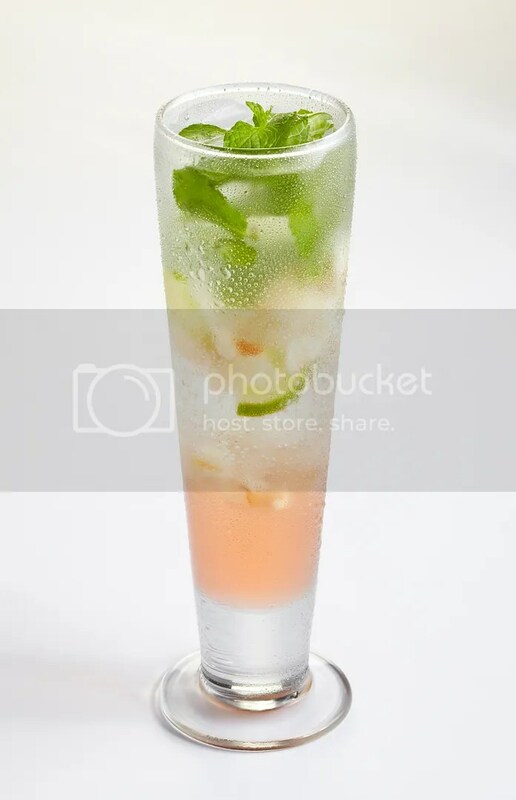 The Lychee Mojito was a little too sweet for my liking but it seemed to be quite popular amongst the other guests at my table. I preferred the Yuzu Mojito because it was really refreshing with a citrus tang and light carbonation. 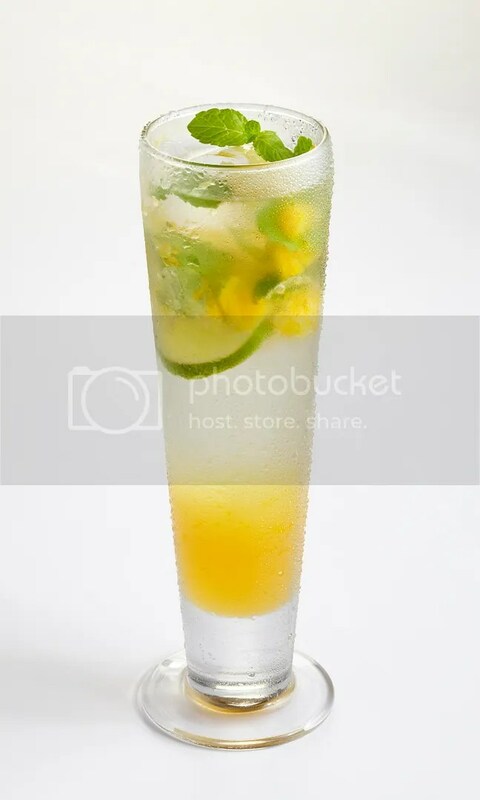 There is also the option of spiking the drinks with soju for an extra kick. 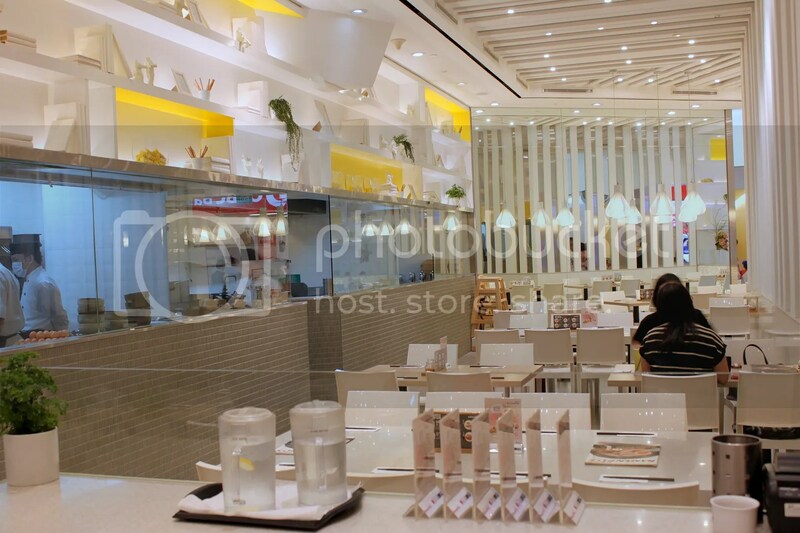 It’s great that RamenPlay is innovating their dishes but overall, I still very much prefer the items on RamenPlay’s existing menu such as the Toroniku Double Soup Ramen, the Cha Shu Tonkotsu Ramen and the various appetizers. Special Thanks to RamenPlay for the lunch invitation! totally unrelated to this entry, I’ve just been to Ember. You’re right. 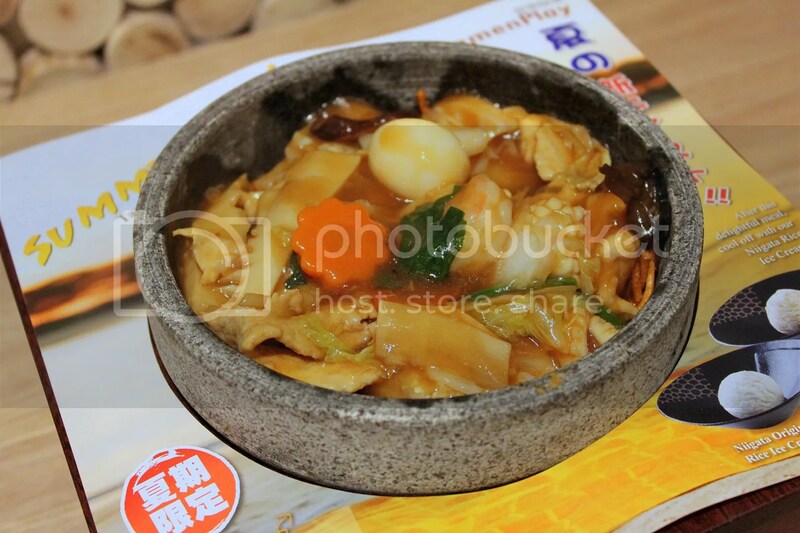 It’s one of the best restaurants in Singapore. One of the best foie gras. Server a bit auntie but tolerable. yea somehow can just imagine the auntie scolding for not finishing the food. haha wanted to post before i fly off for hols in hainan, hk and macau on sat morning!